My daughter and I were having trouble locating a particular restaurant at Star Vista one weekday evening. It was supposed to be right next to Gong Cha but it was vacant. The friendly Gong Cha staff told us that it has closed down. 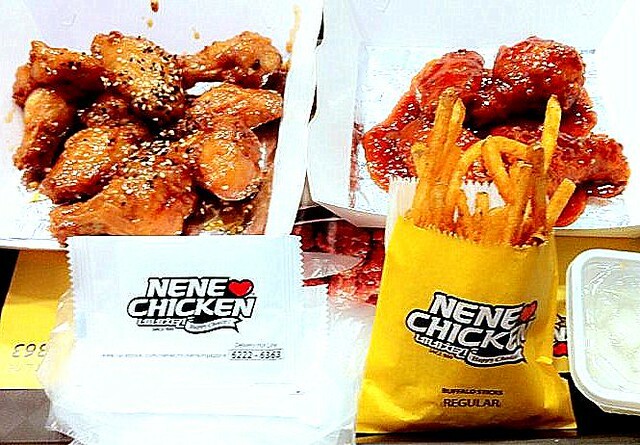 While we were disappointed, we were immediately drawn to another restaurant right opposite called Nene Chicken. It was a small outlet but brightly decorated with vivid colors of orange and yellow. The entire decoration looked very Korean and that immediately reminded me of 4 Fingers Bonchon Chicken Wings at Ion Orchard. We enjoyed 4 Fingers and wondered if Nene would be just as good or better. 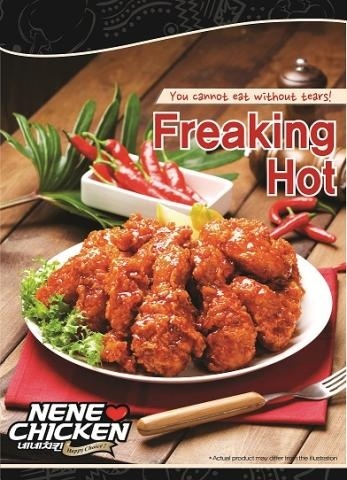 We had never heard of Nene Chicken before but being an adventurous mother-daughter duo, we decided to give it a try. 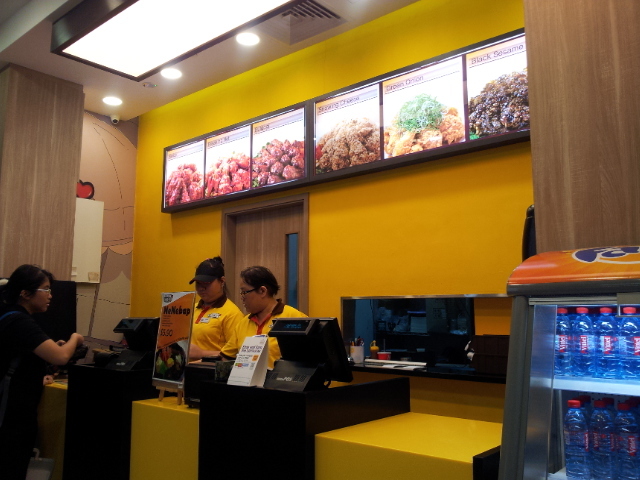 We were glad that the counter staff greeted us warmly with a sincere smile. Right away, we told her it was our first time there and she eagerly explained the menu to us. They served fried chickens coated in different sauces, a total of 7 different flavors. She told us the more popular flavors are Bulgogi, Swicy and Freaking Hot. We decided to try the Bulgogi and Freaking Hot. The staff told us to take a seat and wait for our food. 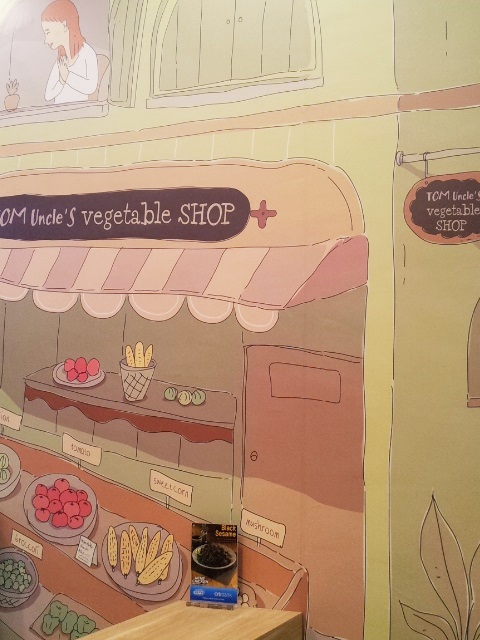 While waiting, we took a good look at the interior decorations and liked the picture wallpaper that covered one entire wall in the restaurant. It was an animated picture of a Nene Chicken outlet with smiling faces, it made us smile too. The chicken pieces are fried only upon order so we waited for about ten minutes before food was served. When we collected our tray of chickens, fries, radish and drinks, we were pleasantly surprised to see that there were 2 plastic disposable gloves and wet wipes that came with the food! How thoughtful that was!! We gently slipped our hands into the glove and started with the fries. They called the fries Buffalo Sticks and yes, they were crispy and tasty. Next, we decided to go for the Freaking Hot chicken. Although the chicken pieces were generously coated with sauce, they were still very crunchy on its skin and the meat were tender and juicy. However, by the time we had the second piece, we could feel our eyes welling up, a burning sensation growing in our heads and our tongue and ears numbing. It was indeed Freaking Hot!!! Argh….. We underestimated its spiciness! We were too proud, thinking that we could handle it! Both of us reached for our drinks and radishes to cool our tongues. 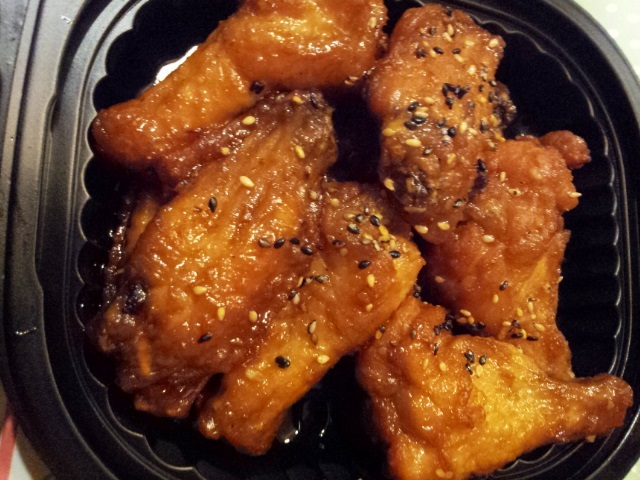 We then decided to give ourselves a break from the spiciness and tried the Bulgogi wings. 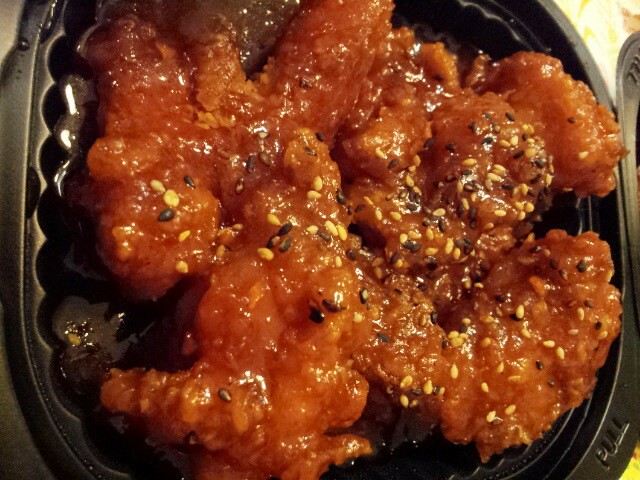 The Bulgogi wings were just as tasty. While we were burnt by the Freaking Hot wings, we were still drawn to it, so we alternate between Bulgogi and Freaking Hot wings. It was a very memorable experience as we were laughing at ourselves, grumbling at the spiciness, praising its taste and still gobbling away, all at the same time. When we finished eating, we said that we must let the rest of the family try them. 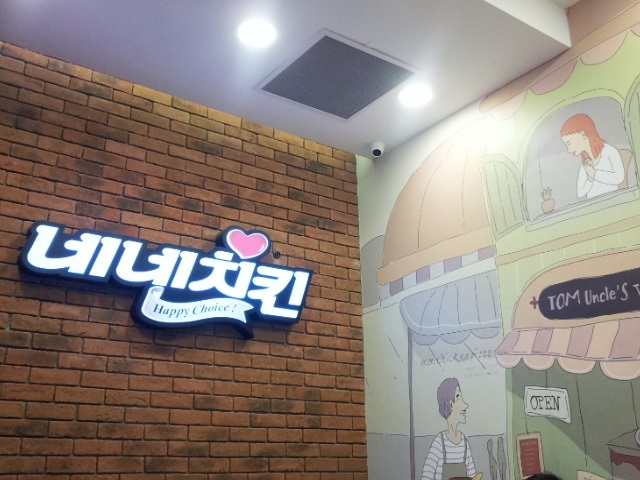 When we stepped out of the restaurant, we noticed a small TV on the exterior wall next to the door, screening a Korean TV commercial of Nene Chicken, featuring Yoo Jae-Suk of Running Man. That was when we realized that this was a Korean franchise. 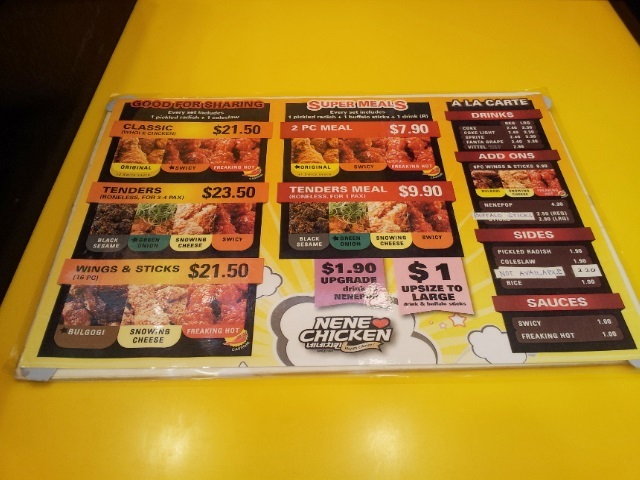 When we got home, we told our family of our highlight of the day, which was obviously the love and hate dining experience we had at Nene Chicken. Since then, we have bought takeaways twice from the restaurant and will definitely patronize them again!